Poor Miss Muffet…it does seem like she has some anger towards everyone in the room, but for Alice she’s trying to rein in her anger towards her as she doesn’t truly see Alice as an enemy like the others. Also one could say that Miss Muffet is her own worst enemy. In other words, she may have anger towards everyone around her, but none of that compares to the anger she has towards herself. She’s on thin ice and something tells me it’s cracking fast. 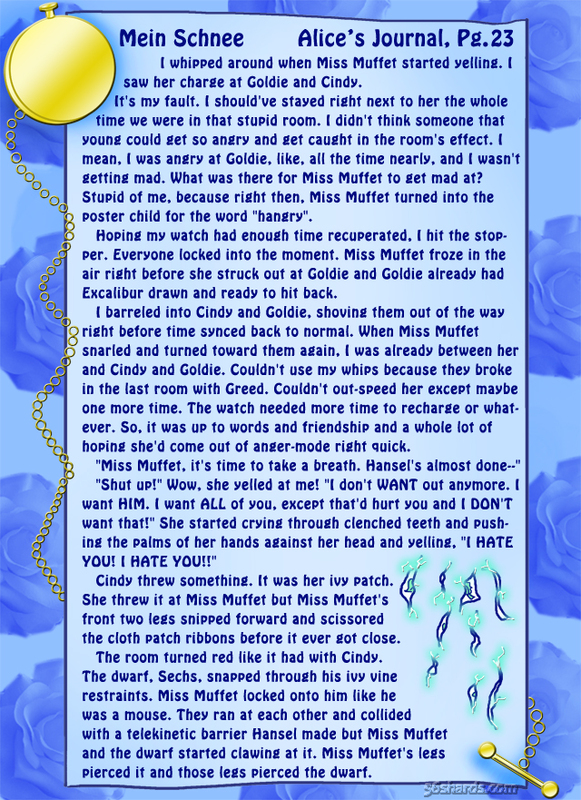 Would the others truly let Miss Muffet destroy Sechs and vice versa or will Alice step in to try to save Miss Muffet ? Something tells me when all is said and done that Miss Muffet will be out of commission for a while after this mission. This is an excellent way of putting things, Marcus! As for what you propose at the end… we shall see. Not all who are broken need help walking away, nor can we always see the cracks which shatter the toughest of glass.